For the 2010 Formula One racing season, we once again have the pleasure to watch ace piloto Michael Schumacher strap in and hold on for all he's worth at the wheel of the Mercedes (formerly Brawn) factory sled. He's taking a lot of flack for his decision to come back after a 3-year 'forced' retirement, and even more because he hasn't yet won a race. To his critics, I say: STFU. The 7-time World Driver's Champion was pushed out of the Ferrari team to make room for Kimi Raikkonen, who promptly won a single title and then spent the next two years on cruise control, ultimately leaving the sport to go... rallying?!?! And now, the Scuderia has drawn in the brilliant but scummy Fernando Alonso to make things right, with teammate Felipe Massa now on the outs and likely to be pushed out at season's end as well. But Mikey... he wasn't finished, not yet. Sure, he broke his neck racing a Moto GP bike and learned there ARE limits to adhesion, but he knew, deep down in his Teutonic soul, that F1 still had things that needed to be done by hissownself. 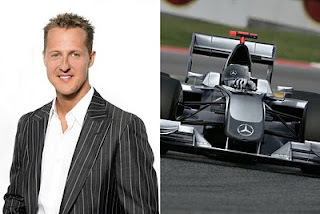 Besides, his big-time racing career started with the Mercedes sports car team, so why not make this final effort on behalf of the Silver Arrows that gave him his first real break? Yes, I'm a major fan of his, have been ever since his first rainy race day at Spa in the lovely Green Jordan. Yes, he spun out and drew his first DNF that day, but his talent was never questioned, and he made things go HUGE at Benetton Renault before his stellar run at Ferrari. He developed a reputation as a brutally calculating driver with sharp racecraft and an eye for the occasional cheap shot, but so what? Results, baby... that's what makes the F1 circus so much fun to watch and enjoy! His marriage? Questionable at best. His mentoring of the fast-but-erratic teammate Nico Rosberg? Priceless. His ability to make a good-but-not-great car jump thru hoops? Obvious. Sooo... now we just watch and wait. He might find the cars are just too far removed from his comfort zone... the competition just too tough... the F1 circus no longer to his liking. All may be true, but for me, the situation is just too juicy to ignore, and I look forward to his first podium of the season and (dare I say it? ), his first opportunity to take the checkers, spray the bubbly and leap into the air, fist-pumping like the racing animal he has always been.